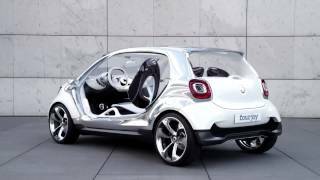 Smart will have the world premiere of the Smart FourJoy Concept, a compact four-seater, at the 2013 Frankfurt Motor Show. The concept has all the typical smart attributes and embodies pure carefree enjoyment of urban life. The Smart FourJoy boasts the agility typical of the brand with its compact dimensions. It is 3494 mm long, 1978 mm wide and has a height of 1494 mm. 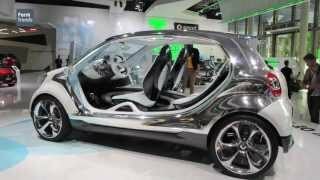 Numerous design elements include the extremely short overhangs, the wheels positioned on the four most outer points, the tail lights integrated in the sturdy tridion cell and the spherical instrument cluster. 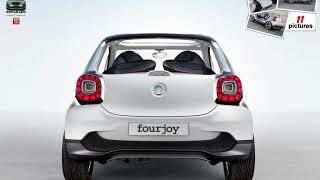 Without doors, a rear window or roof panel the Smart FourJoy really brings the city inside. The most striking interior features are the two futuristic-looking front seats and the rear seat bench with a similar design. The seats and the instrument panel are supported by a continuous central structure. It features a convex surface with touch-sensitive operating functions. The electric drive housed at the rear is based on the current smart fortwo electric drive. Thanks to the 55 kW magneto-electric motor the Smart FourJoy is agile and lively to drive. The lithium-ion battery has a capacity of 17.6 kWh. Two longboards are fastened on the roof of the smart fourjoy. With these electrically driven skateboards it is possible to cover short distances in the city without producing any local emissions.